Grilling. Broiling. Smoking. Roasting. Baking. The kamado grill does it all. And people who use it swear that they could never go back to gas, propane, or even a standard charcoal grill. Kamado aficionados are obsessed with the superior flavour of the food and the grill's seemingly unlimited capabilities. Hot Coals is the must-have resource for kamado devotees. Complete with the kamado's long history, proper techniques for use, and the science behind the grill, plus how to infuse specific flavours and which tools to buy, this book is the comprehensive guide. More than 30 delicious recipes, such as wood smoked haddock, vegetable lasagne, duck breast with orange and thyme, Margherita pizza, focaccia bread and apple almond crumble tart, showcase the cooker's range and demonstrate the rich and savoury flavours infused from the grill. 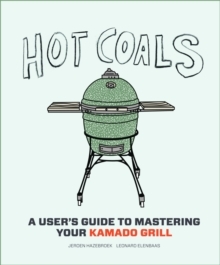 Hot Coals is thorough, informative, and interesting-an accessible package for both novice and advanced kamado fans.